Home / Community Event / What does poverty look like? Circles of Grant County hopes to answer that question for you March 22nd @ 6PM when they hold a Poverty Simulation at First United Methodist Church in Marion, IN. RSVP information is found in the header above. Andrew Sprock, Director of Circles of Grant County, provides some insight on what to expect and how you can support Circles and aid families struggling to break the cycle of poverty. Opportunities to volunteer with Circles of Grant County are on the Serve Grant County website! 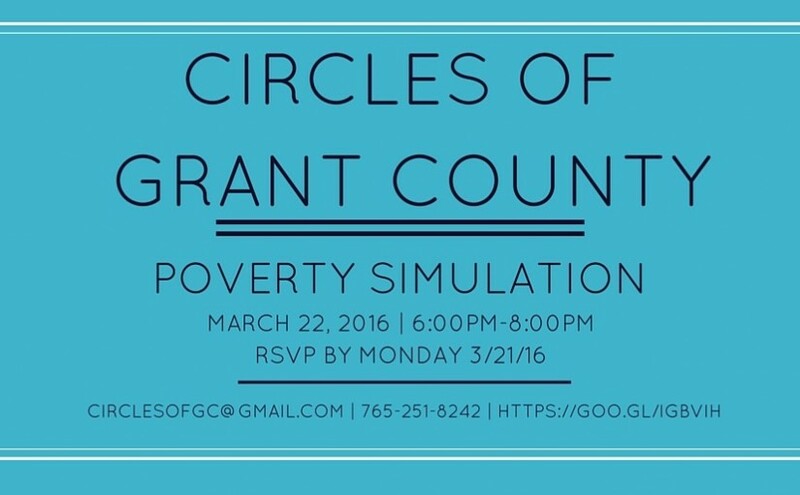 What started the idea of Circles of Grant County holding a poverty simulation? Andrew: Circles of Grant County is part of a network of Circles communities throughout the nation. Poverty simulations are something several of the other Circles communities do and have found it to be a great way to engage the folks in conversations about the experience of poverty. Have a better sense of the challenges that those who live in poverty deal with can build empathy, which is a critical bridge across the economic class divide and is essential to building the partnerships and cooperation it takes for a community to effectively address poverty. What do you see as the biggest hurdles families face when trying to rise out of poverty? Andrew: The Circles model was built in response to research that identified some very distinct differences in the values, practices and beliefs that are common to families in poverty, middle income and upper income. These are not just different socioeconomic categories, but really are different cultures! The research goes on to identify that the that the most effective way to empower families to move from poverty to middle income is to connect them with other families who are from middle or upper income. Out of these relationships come connections to resources that middle/upper income families have, a greater familiarity with some of the hidden rules and cultural values/practices that are associated with the middle income “culture.” One of the things that is true of most of us is that the people we are closest to often share a similar income range and economic experience. One of the biggest challenges for families who want to overcome poverty is that the people they are closest to are often times in a very similar economic situation. The resources, patterns, and support structure provided by families in a similar situation don’t necessarily connect them with the resources and practices that can change that situation. So, one of the biggest challenges is really the divisions between people of different socioeconomic situations. All of us face things that we can’t overcome on our own, and when we are there we need others to walk with us in it! When poverty is the challenge a family is facing, one of the things that can be helpful is relationship, friendships with those whose life experience is different from their own. Through those friendships both the family working to overcome poverty and those in middle/upper income can learn and share resources that can enrich all of their lives and equip families with the extended network of support that can empower them to overcome poverty! What ideas do you hope people take away from participating in the simulation? Andrew: The simulation is an experience designed to stir conversation about the perceptions and challenges of poverty. I hope that for those who participate the next conversation they have about poverty or related issues will be different. It will be different because they have a greater sense of the challenges, they have more empathy for those in poverty, and whether they came in as one intimately familiar with poverty or not they leave with a little more hope that others really do want to know and understand the challenge in order that we might be more effective in together working to empower families who desire to overcome poverty and addressing the systems that make it difficult for those families to do so. How can the community help Circles of Grant County? Andrew: There are a variety of ways to be engaged with us. 1) We are always looking to connect with people who are motivated to overcome poverty or who are willing to walk with such a family along that journey. 2) We meet weekly and share a meal together before our meeting. If you are a part of a group who would be willing to provide a meal on occasion, that would be a big help. 3)Additionally, each month we host an evening where we seek to learn and problem solve some of the systemic barriers that are common to families working to move from poverty. We welcome participation there! 4) As a relatively new organization in our community we are still building a basis for our financial sustainability. We would love for people to join in the effort to transform our community little by little through empowering families to thrive. We would welcome you to consider a regular donation to our work, whether that be $10 a month or a million it is going to take a collection of people who are willing to offer what they are able in order that we can together lift our community toward the future we hope for.